Are you looking for a 6 person backpacking tent? Such items can be big and heavy so finding something appropriate is not so easy unless you want to carry unnecessary weight. So here I give some reasonable options. Backpacking tents are always too small for the declared capacity. They are built to be carried so more space means more weight and the small area they offer is understandable. So when you see a 6-person backpacking tent, this is usually good enough for maximum 4 people or so. But if it is with a pair of vestibules, this may change a lot because you have two storage areas for your boots and backpacks. It might be a better option to have two tents with 3-people capacity. When combined, those can be lighter than one 6-person backpacking tent. To see what I mean, have a look at this list of 3-person backpacking tents, you will realize that some of them are below 2 kilograms. Now, even these ultra-lightweight tents have two vestibules, so the available protected area becomes substantial when you have two tents. But there may be reasons when you want a single tent and one cannot argue about this. It may be the matter of price, or it may be a closed group which wants to stay together in the tent e.g. a family with kids, etc. So, for this reason, I give below a list of a few tents that are lightweight enough to be carried on the trail. I put the limit to maximum 6 kilograms of weight or very close to it. There are no particular reasons for such a limit, except the weight itself. If you are ready to carry a heavier tent, just have a look in the category of tents for 5 & 6 people here in the site, there are many described in detail, check in particular the dome-style tents from this size range. The dome style Big Agnes Rabbit Ears 6 tent. This is a very simple tent with a partial coverage fly. The good thing with such a design is that you have a window (this is just the mesh section in the upper parts of the door). The bad is that you have no vestibules. There is a short brow pole that raises the fly on the front and creates a small awning, so the windows is protected practically all the time and you can use it without the panel which is also there. 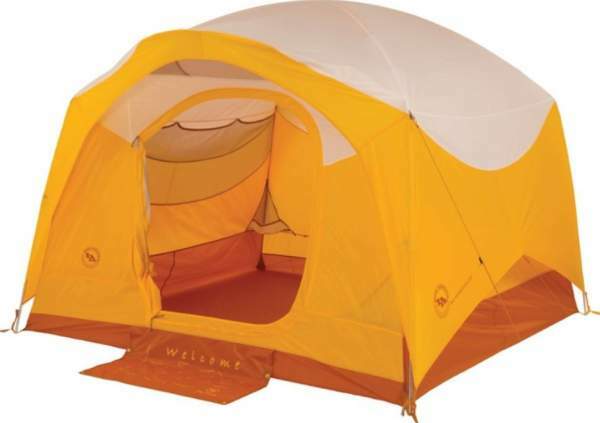 The weight of this tent is 13 lb 5 oz (6.04 kg), and the minimum weight is 12 lb 10 oz (5.73 kg). You have 85 ft² (7.9 m²) of the floor area, and this means 14.2 ft² (1.32 m²) per person. So although you can fit 6 people inside, you will not have much space for your gear. The waterproof rating is decent 1500 mm, and the poles are reliable and lightweight aluminum. This is a reliable tent from a renown brand. 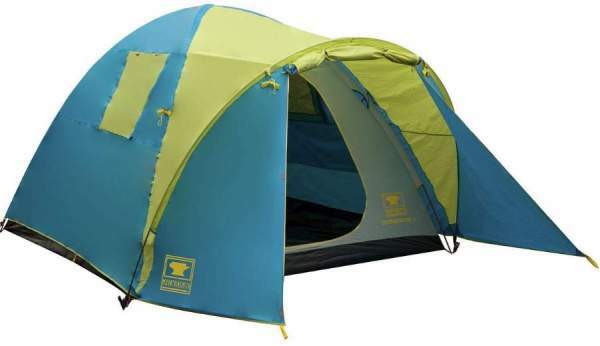 Big Agnes Big House Deluxe Camping Tent 6. The manufacturer of this Big House 6 tent gives its trail weight and packed weight, and they are 12 lb 8 oz (5.67 kg) and 13 lb 11 oz (6.21 kg), respectively. So the trail weight is below the limit of 6 kg which I imposed for the tents to be included in this list here, and the packed weight is also very close to it (from the upper side of course). By the trail weight, they mean the inner tent, the fly, and the poles, just to know. The trail weight is lower than in the Rabbit Ears 6 tent from the same brand which you see above and this is why I put it on this position. This is a luxurious tent among the tents that you might carry on the trail. It is very tall with its 78 inches (198 cm), and it has two huge doors and an incredible number of wall pockets. The poles are very thick aluminum and the waterproof rating is 1500 mm. So this tent offers a decent protection for most situations in a 3 season use. The area is 75 ft² (7 m²). Please follow the link to read more. 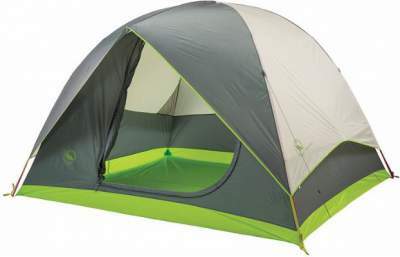 Obviously, this tent is here because of its weight which is only 13 lb 5 oz (6.04 kg), and its capacity which is 6 people. The inner area is 90 ft² (8.4 m²) but you also have a porch or vestibule area which is 29.5 ft² (2.7 m²). As you realize from the picture, this is a full coverage fly, so such a great weight is really surprising. The waterproof rating is really good, 2000 mm for the fly and 5000 mm for the floor. There are 3 poles and they are aluminum. This all you can get for just some $160 or so (as of the moment of writing this text), and I find this simply extraordinary. This is the Mountainsmith brand so you can be sure about the quality of this item. 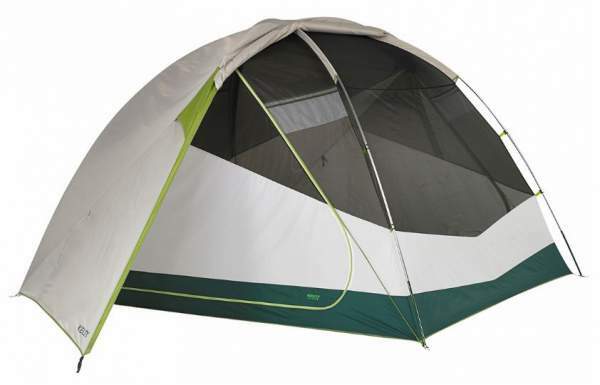 The tent comes with some unique features, so you have windows on the fly, equipped with panels and mesh. The tent is freestanding, but note that the porch has its own pole and it should be staked. 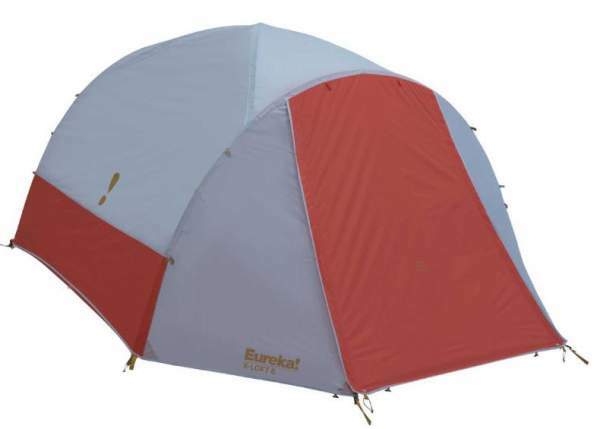 Eureka X-Loft Tent – 6 person. Here you have a remarkable design and a tent that offers 85 ft² (7.9 m²) of the inner area for 6 people. It has also two asymmetric vestibules that provide 30.2 + 16.3 ft² (2.8 + 1.5 m²). So the total protected area is 131.5 ft² (12.2 m²), quite a luxury on the trail. The weight is 13.06 lb (5.9 kg). The packed size is also great (L x D) 22 x 9 inches (56 x 23 cm). The poles are a quality aluminum and the waterproof rating is 1800 mm for the fly and 2000 mm for the floor. So this tent with its full coverage fly will surely protect you regardless where you use it on the trail. Please see more in my full review. Kelty Trail Ridge 6 Person Tent with Footprint. The packed weight of this tent exceeds the limit I assumed for this list, but this is a tent with a footprint which you can leave at home. It also comes with a gear loft which you do not have to carry. So the trail weight which they officially give is 12 lb 3 oz (5.5 kg). The inner area is 82 ft² (7.62 m²), but there are also two vestibules with 17 ft² + 17 ft² (1.6 m² + 1.6 m²). So the area per person is not so bad for a backpacking tent, you have 18.8 ft² (1.8 m²). The tent is with 2 doors. The waterproof rating is quite good, you have 1800 mm and the fly is full coverage of course, so you have a complete protection. 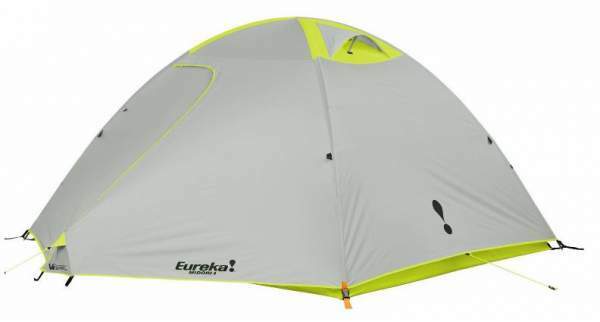 Eureka Midori Basecamp 6 tent. This tent weighs 11 lb 9 oz (5.24 kg) so it is quite suitable for the purpose described here, it is light enough to be carried on the trail. The inner area looks good when you compare it with other tents here, you have 85 ft² (7.9 m²), and the space per person is 1.32 m², but note that you have two vestibules that add 38 ft² (3.5 m²). So this is a big area to store your backpacks. The waterproof rating is quite decent 1500 mm and this is more than enough for most situations in a 3-season use. The poles are aluminum, the floor is bathtub type, so all is done properly here. Please follow the link to see more. 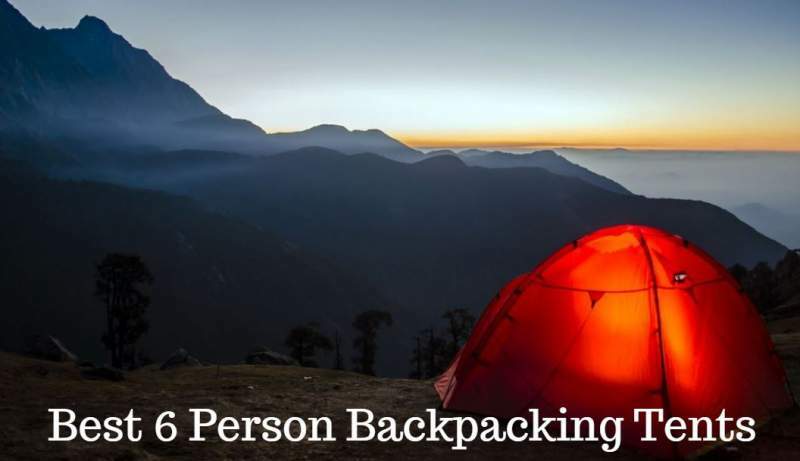 So this was my list which should help you to choose a reasonably lightweight 6 person backpacking tent with enough space for six people. The list will be updated as I continue to search for such tents, so stay tuned and bookmark this page. How to choose really? Those presented here share some common features, like aluminum poles and a decent waterproof rating. The weight difference is not so substantial, so check the protected area. This is where vestibules become important. They are normally very useful and they add a lot of the protected space so if this is about a larger group, you will need them. But vestibules must be staked properly to be functional and this depends on the terrain. Sometimes the ground is such that it is difficult to stake the tent, like a sandy area which does not keep stakes or simply rock where you cannot use them. In such a case go for a completely freestanding option and the partial fly, you have a great example of that type, the Big Agnes Rabbit Ears 6 tent. Such a tent you can pitch anywhere, the fly is attached to its corners and you do not depend on the ground type.